Fallow deer is one of the rarest adorable species of quadruped animals in the wild. This beauty is a safe species and is likely to adorn the world for quite some ages now. They are not only a treat to the eyes but are very interesting to observe also. They are a very sophisticatedly social species. Height : The male Fallow deer, called Bucks, are usually 84cm to 94cm in height. The female Fallow deer, called Does, are usually 73cm to 91cm in height. Length : This species is usually 4ft to 5ft in length. Body : Fallow deer is a quadruped creature. Its trunk rests on its four feet. Colour : Fallow deer has two colour phase. In summer, the species is brown in colour with white spots all over the body. The underneath side of the body is creamy white. This summer colour phase starts from May and sustains till October. During their winter colour phase, they are greyish brown without any spot on them. Tail : Tail of a Fallow deer is black on its upper part and white on the underneath part. Antlers : Antlers of a Fallow deer is flat, and palm-shaped with many points on them. During rut, Bucks, the male ones, make a burping sound to call and attracts the Does, female ones. This burping sound is called “groaning”. The Fallow deer also “groan” to challenge other Bucks to the antler fight over a single Doe. This species of deer are herbivorous, like all other species of deer. The Fallow deer are grazers. They diet on grass, leaves, acorns, sweet chestnuts, young shoots, heather, cereals, bark, herbs, and berries. During the dry season, when the grass chocks in throat like needle, forbs form a big part of their diet. The Fallow deer prefers inhabiting in open woodlands of different types. The open woodlands may be coniferous, agricultural, or even broadleaved ones with under-storey. Fallow deer is a socially bonded species. They roam around in groups. But the groups are usually divided into two segments – females or the Does with the younger ones, called the Fawns, hang around together in a single group; and the males or the Bucks hang around in one group. The two genders come together only during the breeding season. The two genders mix around freely in groups to socialise in open areas, throughout the year. Originally an Eurasian species of dears, the Fallow deer, is widely found scattered all over in Europe and a vast region of Asia. It is found in some parts of Middle East and the Mediterranean region. It is found in Ukraine, a few areas of United States of America. The reproduction procedure of Fallow deer is called rut. Does, female Fallow deer, reach sexual maturity at the age of 16months. Bucks , male Fallow deer, reach sexual maturity at the age of 14onths. Does are completely capable of reproducing off-springs at the age of 2years, but the Bucks become capable almost at the age of 6years. Gestation period of Does last for about 8months. They look for a cozy and private place to give birth to the Fawn. Average life span of a Fallow deer ranges between 12years and 16years. The longest recorded life span of Fallow deer is 25years in captivity. Fawns, young Fallow deer, are often being preyed by foxes, wolves, and other carnivorous animals in the wild. Tigers, lions, wolves, bears, lynxes, are the most common species of animals that prey Fallow deer. Fallow deer has a very sharp and minute vision. They can see even the slightest motionless creature at quite some distance. Persian Fallow Deer is a sub-species of the Fallow Deer family. Scientific Name : The Persian Fallow deer is scientifically known as Dama dama mesopotamica. Looks : Persian fallow deer though a sub-species, but are much bigger in size than usual Fallow deer. 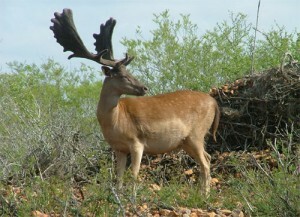 Their antlers are also bigger than that of common Fallow deer. Distribution : They still exist in some part of northern Iraq, southern Iran, a few areas of northern Iran, parts of north-western Iran, and northern parts of Israel. Conservation Status : Persian Fallow deer species are endangered in the wild. The species are bred with utmost care in zoos in Germany, Israel, and Iran. Fallow deer make an exotic pet. The innocent beauty is a safe species as of yet. 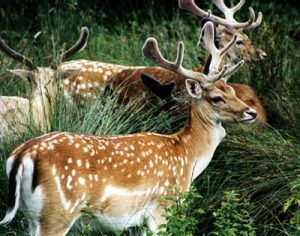 Persian Fallow deer, the sub-species of Fallow deer, is already under threat of existence. Let us preserve this wonderful species on Earth. They can be very adorable and easy to handle pets. Their care taking is not chaotic, they are not menacing types. Their elegant beauty along with their sweet nature, make them even more adorable. Fallow deer makes a very adorable and convenient pet. Housing : It is not difficult to house Fallow deer. Give the Fallow deer a little space in the backyard garden to walk around. Care needs to be taken that the deer do not loiter around inside the house otherwise it does not need to be chained or caged. Feeding : Diet of the Fallow deer is simple and easy to avail. This species is herbivorous. Some green grass, and corns, and other simple vegetations form an excellent diet for them. Caring : Bath the Fallow deer once in a while. Do not try to bathe them forcefully during their skin colour change season. As for nurturing, they do not need much of it, just some warm affection and lovely cuddles can do wonders in taming them. Fallow deer is a very innocent species of animal. Read some interesting facts about this species. Though the female Fallow deer reach sexual maturity after the males, still the females become capable of reproducing much before the males attain the capability. 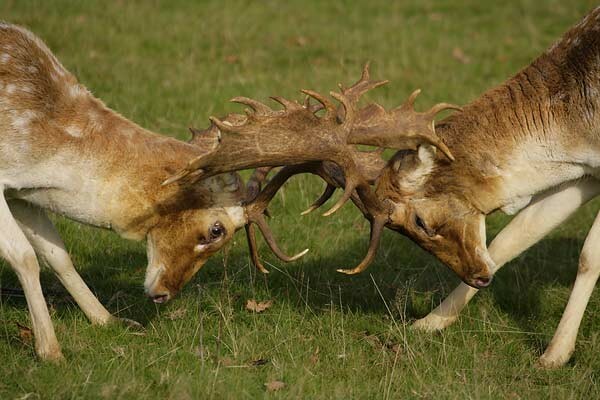 During mating season, the male Fallow deer engage in antler fight over a female Fallow deer with other male ones. Call of the Fallow deer is called “groaning”, where as it sounds like burping. 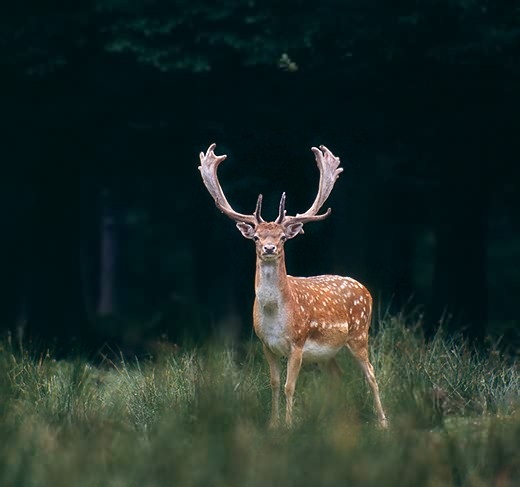 Unlike many animals, the Fallow deer prefer residing in open woodlands. The species is very elegantly social. They roam in separate groups of females with the young ones and the males roam in separate groups. The two groups mix freely but get close only during the breeding season. The Fallow deer have two different colour shades. One in summers, and another in winters. Given the extremely convenient diet and other hassle free habits, Fallow deer makes an exotic and adorable pet. According to IUCN research reports, the species of Fallow deer is perfectly safe as of yet. There is no threat to the species in the near future at least. Really interested in having a Fallow fawn on my 14 acres.